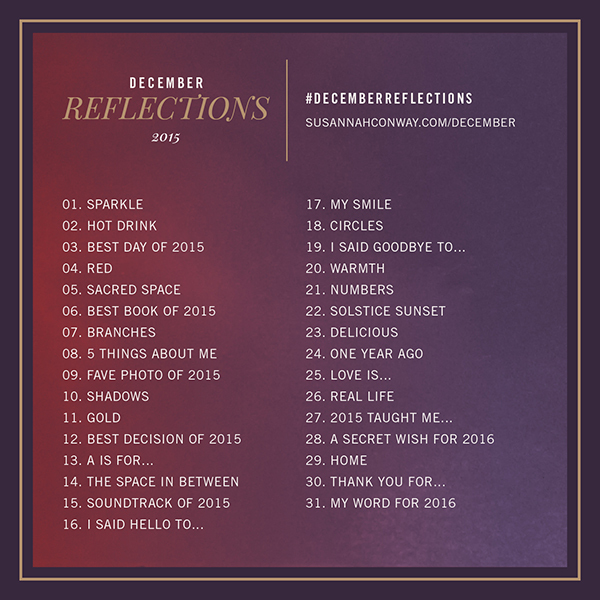 Something to SEA: December Reflections is Back! 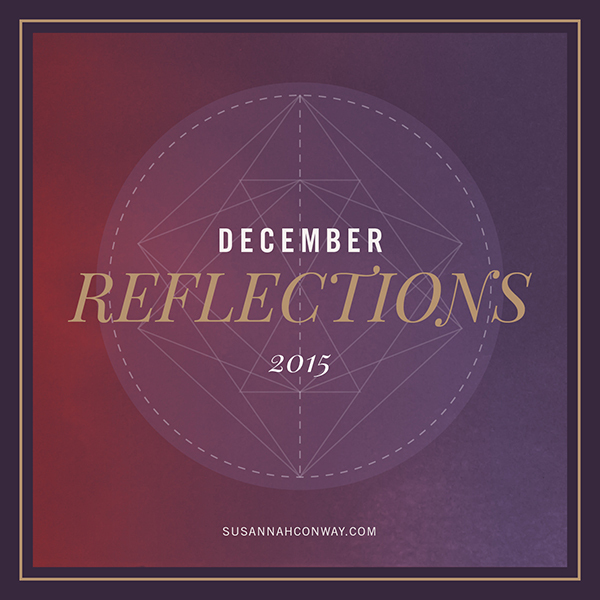 I was so excited to learn that Susannah Conway is once again hosting “December Reflections,” a photo-a-day challenge based upon her daily prompts. It’s a wonderful way to end the year, both by reflecting upon the past 12 months and looking forward to what’s ahead in 2016. It was just about this time last year that I happened to stumble upon her work, and I am so glad I did. She has proven to be an insightful and inspirational role model, and while I have no idea how I was brought to her website in December of 2014 (I think it was the hands of fate), I am not the same person I was then simply because of her gift of words. I am certainly entering the last month of 2015 with more confidence, joy, solace, and optimism about the future than I entered December 2014. Susannah helped me find “my tribe” and “my voice,” and is one of a few influences who led me to learn so much about myself over this year. I look forward to what December brings, to enjoy each and every moment possible, and to continuing to grow and learn about myself. It’s here! It’s here! Today is Thanksgiving, my favorite holiday. I feel the same on every Thanksgiving, and I think I write almost the same thing every year too in my journal, but this is the first time I am sharing it publicly. I love Thanksgiving for so many reasons. First and foremost, I love spending the day with my family. I miss my four grandparents, but their legacies are still present at each Thanksgiving through the sugar coated dates on the buffet and the marching bands and balloons in the parade. The Macy’s Thanksgiving Day Parade is cheesy and corny, and I am not a fan of musicals or performances, but I have to watch the parade every year from start to finish because it is like my grandfather is sitting next to me as I watch it. I was trying to explain the importance of Santa arriving at the end of the parade to my journalism students this week, and I don’t think many of them understood. When I was young, I was told that the Santa in the parade was the REAL Santa, and that he only came down from the North Pole for the parade and for Christmas deliveries. Because he was the REAL Santa, I couldn’t wait to see him in the parade. And when I was young, after he appeared, that was when the Christmas commercials would start. His appearance was the harbinger of the Christmas season. Now, Christmas commercials start running in the beginning of October, which takes a lot of magic out of the season. I know that when Santa appears later today, I’ll once again have a tear running down my cheek as I remember about the magic of childhood and wish to have a little of that lost magic back. Thanksgiving also means family and football. I’ll be spending the day at my mother’s home with my family. Everyone contributes to the meal, which includes turkey, corn, sweet potatoes, mashed potatoes, green beans, brussel sprouts, turnips, stuffing, apple and pumpkin pie, and more. We will eat and laugh together, and enjoy each other’s company. I’ll play with my nephews, and perhaps take them for a nature walk around the neighborhood. And I’ll root for the Lions, as I do every Thanksgiving. Last year, we had to adjust to a different Thanksgiving after losing my father in law. I missed making Poppy laugh and his kind smile at the table. It was just as difficult as when we had to adjust in 2007 after losing my brother in law, Michael, to cancer. One of my favorite memories with him was his last Christmas in 2006, when we both stood at the counter and ate our dinner together, as the table was too crowded. Like many important moments in my life, I can picture it in my mind like it happened yesterday, yet I didn’t realize the importance of it at the time. I am so thankful for that memory and for Michael’s encouragement and advice, which ultimately changed my life. This year will again bring another adjustment for our family, as this is the first Thanksgiving without my Dad. His 74th birthday would have been tomorrow, and we usually celebrated his birthday on Thanksgiving. Last year, it WAS his birthday on Thanksgiving. I will miss watching football with him, and hearing his laugh. It will be different without him at the head of the table this year, but my brother thought of a great idea. His 18-month old son, who happens to be my Godson, will take Pa’s place at the head of the table. He will share our childhood memories and traditions of Thanksgiving, Christmas and Santa with his two sons so they can continue the customs our parents began for us. This year, I am going to bask in every moment and take it all in. I hope to absorb every sight, sound, smell, and taste, and cherish every memory, as my brother so wisely advised. I hope that next year, when I am writing my Thanksgiving retrospective, that everyone is still with us, and that we will gather together again for a celebration of gratitude. I am thankful for the people in my life: family (especially my niece and 3 nephews), friends, colleagues, and students. I am thankful that my health isn’t worse than it is, and that I can get through each day with Lupus and Fibromyalgia (even though both are flaring and I’ve had to make many adjustments to my schedule to deal with these “service disruptions,” as I like to call them…but it could be so much worse). I am so very thankful for my husband, who is my best friend. And I am thankful for every laugh, smile, tear, and moment along the way. It’s Thanksgiving Eve, and I’m sitting here remembering what this day was like when I was in high school. The bonfire was the tradition of my home town. I would escape the insane cooking frenzy in my house and go to the bonfire with friends. After the fire was put out, we’d tool around town on our bikes to see what everyone else was up to, or if it was too cold, we’d just go to someone’s house to hang out. On Thanksgiving, we’d go to the Thanksgiving football game at our town high school (or at the rival school, if it was an away game), then head home for our individual family Thanksgiving feasts. I don’t think Black Friday even existed back then (and quite honestly, I wish it didn’t exist now). In 1989, the Thanksgiving-eve bonfire was extinguished rather early by our local fire department. The trucks left quickly and went screaming up to the boardwalk, sirens blaring, to a multi-alarm fire that ultimately destroyed the Jenkinson’s Pavilion building. It was lightly snowing as we all headed up to the boardwalk to watch the fire, and we could see the eerie orange glow in the sky from over a mile away. I can remember tearing up as I saw the massive flames leap into the sky, consuming the building minute by minute. I wasn’t only just watching a fire…for me, it was personal. I was witnessing the destruction of many memories. You see, I worked for a little over 4 years in the arcade (from when I was 14 through my high school graduation in June of 1989) that was now fully engulfed and ablaze. I can see that fire as bright in my memory as what I did earlier today. I can still smell the burning wood, and that burned and musty smell hung in the air for a long time around here. Today, I am thankful for you. You, who are reading this. I am so grateful that you spend a part of your very valuable time to read my words. Without you, I wouldn’t have an audience, and my words would not have any meaning. As a thank you, I have made a free Gratitude printable for you, which is below. It is suitable for framing and is sized for 8.5 x 11…it should fit exactly in a document size frame. You can download the .pdf file by clicking here, or you can right click on the image below and save it to your computer as a .jpg file. My thanks to you for your support, and my best wishes that you have the most memorable Thanksgiving ever. Today I am going to keep it short but poignant. I have food, shelter, a vehicle, clothes, and heat. How often have I overlooked these basic necessities as blessings? When I look at the big picture and actually realize that there are so many without a hot meal, without heat or a place to call home, without transportation, and without clothing, I clearly see how blessed I truly am. In addition to just being thankful for these necessities, I aim to help those less fortunate by donating food and clothes not only this holiday season, but as a regular practice every month. Please join me in doing something to help others; no matter how small or how big your gesture is, you can do something to ease another’s burden. I started keeping a gratitude journal earlier this year, which has made me more aware of people, things, and experiences that I previously took for granted. It has changed my outlook and attitude, my perspective and awareness. It only takes me a few minutes every day to jot down my blessings and thanks, and what I am thankful for today is exactly what I wrote about over the weekend in my journal. Today I am thankful for old friends. I recently had the opportunity to get together with some very special people that I used to work with at a local day camp during the summer. It is hard to believe that more than 25 years has passed since we were guiding campers through their daily schedule of arts and crafts, swimming, trail hiking, games, and paddle boating. The years between then and now are an amalgum of experiences, achievements, losses, and separate journeys. Despite the years and the individual paths we all took, we were able to get together without missing a beat. We each have our own stories, but together, we still were as one. We laughed at old memories and at photos of us back in our camp days. What one person forgot, another person remembered, and so on. Good people and great company. The only downside was that a few of our group were not able to be there, and I hope that we can all get together again in the future. Elisabeth Foley wrote, “The most beautiful discovery true friends make is that they can grow separately without growing apart.” My friends and I did grow separately, but after the time we spent together, it is obvious that we did not grow apart. I think also of my two oldest friends, one I’ve known since kindergarten, and one I’ve known since second grade, and how grateful I am for their friendship. We might not see each other like we used to when we were younger, but that makes the time we do get to spend together that much more meaningful. I know I can count on each for an encouraging word, a supportive shoulder, and a ton of laughs. To my camp friends, my childhood friends, my high school friends, my college friends, my current & former work friends, friends I lost touch with, and, well, ALL of my friends, I am grateful for your friendship. Thank you for the memories we made together, the laughter we shared, and for the footprints you left in my heart and in my life. We are approaching my favorite week of the year. Thanksgiving is, and has always been, my favorite holiday. To honor this very special week, I am going to write each day about something or someone I am thankful for. For day one, I am thankful that my husband and I put ourselves first for once. Last week, we lived life by our terms and were able to escape with each other. I limited my technology use and checking of social media, and instead, focused on the present moment while taking in what I saw, what I heard, what I smelled, and every possible detail of where I was. Based upon what I’ve seen and read since I’ve returned to reality, it was a good week to unplug. So much hatred, judgement, terror, fear, anger, arguing, hypocrisy. Everyone is right, yet everyone is wrong. I agree with everyone, yet I disagree with everyone. It’s quite the societal paradox at the moment. There’s an episode of “Family Guy” where Peter Griffin says, “Well, sir, while I may not agree with what you say, I’ll defend to the death your right to say it.” Various forms of this quote has been attributed to Voltaire, Oscar Wilde, and others. To kindly put it, to those spending so much energy and time arguing, remember that we are all in this together. We have the right to our own opinions and to state those opinions. However, we have to remember to respect the opinions of others, even though they might be vastly different from ours. Elizabeth Gilbert sums it up much better than I can in her post from November 17, 2015. By focusing on gratitude and unplugging, perhaps you can have a more positive peace of mind while taking in the sights, sounds, smells, and wonders around you, ones you might not notice if you are scrolling through your Facebook feed or writing an anger-filled comment. It’s a great week to do so. Choose gratitude. Choose to live in the moment. Hello friends! I haven’t posted in a while for good reason (separate post coming about why) but I’ve been saving interesting websites to share. It’s a cool day here, bright with sunshine, so please don’t check these out now if the day is beautiful wherever you may be. This Car – how awesome! I know my sister-in-law would love this, as would I. The Power of Being Present in an Age of Urgency – yes, yes yes! Free Thanksgiving Printables – I think I posted these in an earlier Rainy Day Clicks, but I posted again here so you didn’t have to search for it. It’s been 13 and 11 years, respectively, that you were a student in my English class. You both sat at a desk for 180 days, Ron during 9th grade and Nick during 11th grade, and spent 50 minutes every day writing, reading, learning vocabulary, completing assignments, and earning your grade. And during those 180 days, each of you made a lasting impact and taught lessons to someone who was supposed to be teaching you. Ron, I will never forget how you read “Of Mice and Men” aloud in your best British accent, yet you read your part in “A Midsummer’s Night Dream” with a thick, southern accent. Laughter, that’s what I remember. Pure laughter. I remember you enjoyed writing, but as a freshman, you didn’t want to admit it. How I wish I kept some of your essays and reflections, for they were good…much better than a typical 9th grader’s writing. I remember your pride in your hometown, your blue mohawk, and your incredible effort on the football field, playing each game like it was the super bowl. It wasn’t the same when you moved away, and there was a huge hole of missing spirit that couldn’t be filled by anyone else. Through the magic of social media, we caught up after you graduated and I enjoyed seeing the pictures of you in your band, and then as an Army ranger. I am sure the US Army knew immediately that they were getting one of the best of the best. Nick, your smile and your work ethic are what I most remember about you. No matter what it was you were doing, you always your best…in the classroom, on the field, on the stage…and you never, ever complained. More often than not, you surprised even yourself by doing better than you ever expected. And that smile…that big, wonderful smile, with that impish spirit behind it…there’s no other smile like it. I fondly remember your part in The Varsity Lettermen’s TWO acts for Hawkapalooza, working hard to perfect each routine, and selecting that perfect dress for your costume, the powder blue shift with the rhinestone broach. There hasn’t been a routine like both of those since. One of the best days in my life was the last time I saw you, when you were home on leave and stopped by the school for a visit after classes let out. I was having an extremely bad day and wanted nothing more than to go home, and I got a call from the main office that someone was here to see me. That was the last thing I wanted, but my anguish was quickly replaced with excitement and happiness as I saw you round the corner of the hallway with that smile beaming as you walked down to my classroom. We spent about 90 minutes catching up and talking, and those are the best 90 minutes I ever spent in my life. While I don’t have a photograph of that moment, the picture in my mind’s eye is crystal clear, like it happened yesterday. Words cannot express the extreme heartache and sadness that I, along with so many others, felt upon hearing the news that each of you had passed away. In fact, I remember exactly where I was standing when I got the news about each of you. Yet, upon knowing that so many others were saved because of each of your actions, I now have two heroes to look up to for the rest of my life. Not a day goes by when I do not think of both of you. Several times every year, but especially on Veterans Day, I share your stories with my students who sit in the same desks that you did…stories of heroism, of bravery, and of courage.